Novas occur if the strong gravity of the white dwarf pulls material from its nearby orbiting companion if it is close enough for a gravitational pull. See the artist's illustration to the left. If enough hydrogen gas accumulates on the surface of the white dwarf, a runaway nuclear fusion reaction will take place resulting in a humongous hydrogen bomb blast. The hydrogen atoms on the surface of the white dwarf get fused into helium atoms and the excess energy that is released generates the huge explosion. Only the outer layers of the white dwarf are blown away, producing an outburst that can be observed for a period of days or even hundreds of years. This process continues until the companion star loses all the material that falls within the gravity range of the white dwarf. In some cases the whole companion star is eaten, in which case the process can take up to a thousand years. The hydrogen explosion also creates a shock wave that travels at supersonic speeds through the surrounding gas as the materials expand into space. To the left is a composite photo of GK Persei, a nova that became a sensation in the astronomical world in 1901 when it suddenly appeared as one of the brightest stars in the sky for a few days. Astronomers cite GK Persei as an example of a “classical nova”. 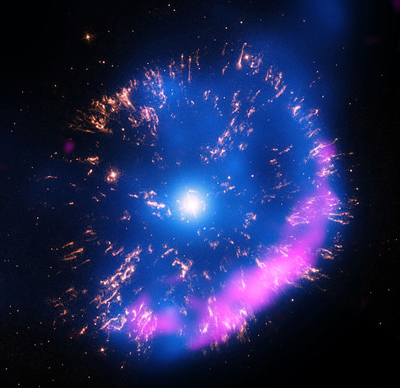 The image of GK Persei (to the left) contains x-rays from Chandra (blue), optical data from NASA’s Hubble Space Telescope (yellow), and radio data from the National Science Foundation’s Very Large Array (pink). The x-ray data show hot gas and the radio data show emissions from electrons that have been accelerated to extremely high energies by the nova shock wave. The optical data reveal clumps of material that were ejected in the nuclear explosion. NASA's Chandra space observatory first observed GK Persei in February 2000 and then again in November 2013. This 13-year baseline provided astronomers with enough time to notice important differences in the x-ray emissions and their properties. Over the years that the Chandra data span, the nova debris expanded at a speed of about 700,000 miles per hour. This translates to the shock wave traveling about 90 billion miles during that 13 year period. Type I supernova - is a type of supernova that occurs in binary systems (two stars orbiting one another) in which one of the stars is a white dwarf. The other star can be anything from a giant star to an even smaller white dwarf. Type II supernova - a star runs out of nuclear fuel and collapses in on itself because of its own gravity eventually causing the whole star to explode. Type Ia (type one-a) supernovas originate from a star swallowed by a nearby white dwarf in a binary star system. As the gas of the companion star accumulates into the white dwarf, the white dwarf is progressively compressed. This sets off a total runaway nuclear reaction that leads to a cataclysmic outburst. Astronomers use Type Ia supernovae as "standard candles" to measure cosmic distances because all Ia supernova blaze with approximately equal brightness at their peaks. There are also type Ib and Ic supernovas that undergo core-collapse (same as Type II supernovas explained below) but they have lost their outer hydrogen envelopes in the explosion. All type I supernovas lack a hydrogen signature in their light spectra. A much more intricate discussion of Type Ia supernovas can be found here. Heavier elements build up at the center, and the star gradually becomes layered like an onion, with lighter elements toward the outside. Once the star's core grows past a certain mass (the Chandrasekhar limit), the star begins to implode. The core continues to heat up, becomes denser, and eventually the implosion bounces back off the core sending the outer material into space. What is left is a super dense body called a neutron star. Pictured at the left is the Crab Nebula, a former supernova Type II neutron star. In the center in light blue is a pulsar propelling particles almost at the speed of light. There are also sub-categories of Type II supernovas based on their light curves. 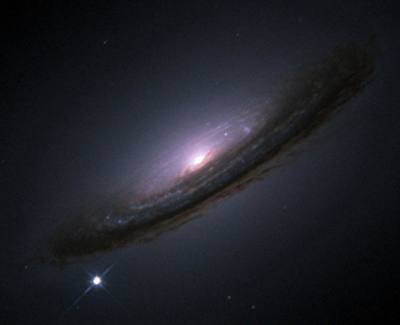 The light of Type II-L supernovas declines steadily after the explosion. Type II-P's light stays steady for a time before diminishing. All Type II supernovas "do" have a hydrogen signature in their spectra. 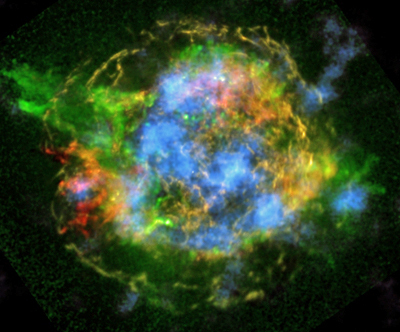 A NASA view of Cassiopeia A (released February, 2014, image at the left) shows a more complete picture of the remains of the star that blew up in a supernova. Cas A, as it is known, is located about 11,000 light-years away from earth, but its light only reached earth about 350 years ago. NASA's Nuclear Spectroscopic Telescope Array (NuSTAR) is the first telescope capable of taking detailed pictures, shown in blue, of high energy x-rays from radioactive materials. Lower energy x-rays from non-radioactive material, previously captured by NASA's Chandra X-ray Observatory, are shown in red, yellow and green. The red color shows heated iron, green represents heated silicon and magnesium, and yellow represents a range of x-ray energies. Note that the blue areas are unevenly dispersed throughout the image, not concentrated in a uniform area. 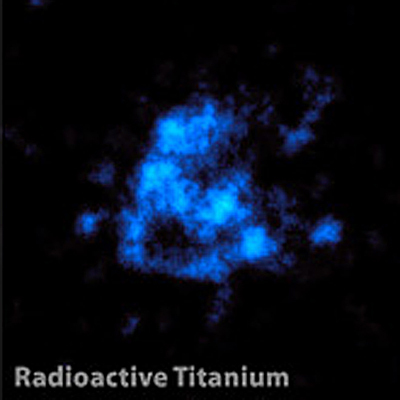 NuSTAR can see radioactive elements like titanium-44, the decay of which sends out high-energy x-ray light. By mapping titanium-44 in Cas A, scientists can get a look at what happened to the "core" of the star when it was blasted to smithereens (see the image to the left below). Previous x-ray images (like at the top of the previous section) could capture only the outer layers of the explosion. Exactly how Type II supernovas explode has been a mystery for some time. The most popular theory explains that when a massive star runs out of hydrogen for nuclear fusion, gravity eventually takes over and begins crushing it, building up pressure inside and fusing together much heavier elements such as gold, calcium and iron. When there is nothing left to fuse, at the very center of the star tiny particles (neutrinos) form and start heating up materials behind a shock wave. “Stars are spherical balls of gas, and so you might think that when they end their lives and explode, the explosion would look like a uniform ball expanding out with great power,” NuSTAR’s lead scientist, Fiona Harrison at CalTech, said in a statement. “Our new results show how the explosion’s heart, or engine, is distorted, possibly because the inner regions literally slosh around before detonating”. Scientists now believe heavy radioactive materials slosh around in the heart of a Type II supernova reinvigorating the initial shock wave, which then allows it to blow out the star's outer layers in a massive explosion. On the morning of Oct. 6, 2013, two images of the patch of sky around NGC 7610 streamed onto the computers at the Weizmann Institute of Science in Israel. A bright white spot had appeared to the left of the galaxy. “Less than 24 hours before, there was nothing there and suddenly you see there is something,” said Ofer Yaron, an astrophysicist at the Weizmann Institute and the lead author of the study published in February, 2017 in the journal Nature Physics. Young supernovas are hard to find. Not knowing when and where they are going to explode, astronomers usually come upon them when they are already several days old. Due to advanced scanning techniques at the Palomar Observatory near San Diego, the sky is automatically scanned in search of new sources of light. Each night, the telescope sweeps across a wide swath of the sky, automatically snapping images of what it sees. That October morning, a supernova was spotted only 3 hours after its explosion - a very, very short time by astronomical norms. Within 6 hours of the explosion, the massive Keck Telescope in Hawaii began to take spectra of the supernova (an analysis that separates light into its component wavelengths) - the earliest data ever taken. The detection was so rapid that researchers could image the "circumstellar material (CSM)" that surrounded the exploded star (see the orange ring around the white supernova in the artist's impression above). It was a type II supernova that occurs when a massive star evolves into a red supergiant. In their waning days, these huge, relatively cool bodies start to unravel, expelling huge amounts of their mass such that they are surrounded by shells of their dense gas called "circumstellar material". In the past, it has been difficult to study the CSM, because it gets swept away by ejecta (stellar shrapnel) once the star explodes. But the spectra taken by Yaron and colleagues captured this gas shell before it vanished. 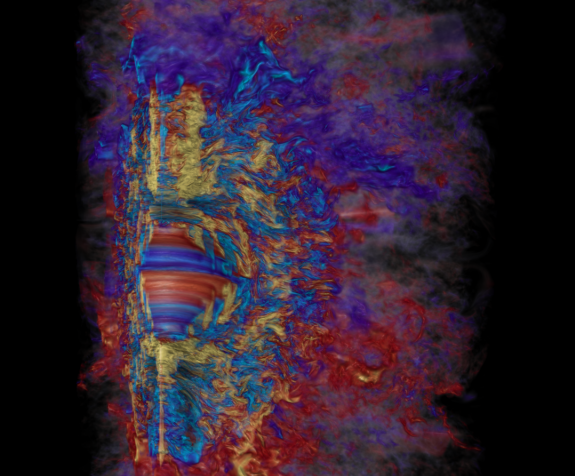 A simulation, using the Blue Waters supercomputer (one of the largest in the world) at the University of Illinois, of the collapse of a massive star into a Type II supernova proves that this process can generate the enormous magnetic fields needed to explode the star and fire off tremendous bursts of gamma rays. See the simulation image to the left. The results of the simulation of this process (published in "Nature" in November 2015) demonstrate that as a very "rapidly rotating" star collapses, the star and its attached magnetic fields spin faster and faster, forming a dynamic electric field that increases the magnetic field up to a million billion times the magnetic field of earth. The team's simulation took 18 days of around-the-clock super-computing by about 130,000 computer processors to stimulate just 10 milliseconds of the core's evolution. A core-collapse supernova occurs when hydrogen fusion in the core stops after all the hydrogen is used up and the star begins to fuse helium and then carbon and oxygen. When the star finally fuses all these elements into iron, fusion stops entirely and the pressure at the core of the star can no longer support the gravitational weight of the surrounding material and the star explodes. Ia Supernovas Reveal "Dark Energy"
An example of a Type Ia Supernova is the bright spot at the lower left of the galaxy in the picture at the left. Since all Type Ia supernovas have about the same mass at the time of explosion, they all give off about the same amount of light. Therefore Ia supernovas are extremely "unique" because they all have about the same maximum brightness at their peak just after they explode. Type Ia supernovas that exploded when the universe was half its present age behave the same as current ones do today. So the "peak brightness" can be used as a "standard candle". Type Ia supernovas are superb candles - stellar explosions so bright that for a few days they can be brighter than entire galaxies. Therefore how bright (or dim) they appear reveals their distance. A far away supernova can be compared to a relatively close one (whose distance is known by other means) which yields a very good estimate of the far supernova's distance. Since we know the speed of light (c), dividing the distance by "c" equals their age. Saul Perlmutter, Professor at University of California, Berkeley and Nobel Prize winner, developed a technique to calibrate all Ia supernovas to a standard size as shown in the graph to the left below. "Simply by stretching the time scales of individual light curves to fit the norm, and then scaling the brightness by an amount determined by the required time stretch, one gets all the type Ia light curves to match" says Perlmutter. "The detailed uniformity of the type Ia supernovas implies that they must have some common triggering mechanism." Dots of the same color represent data from each supernova plotted. The data fit the standard curve extremely well. 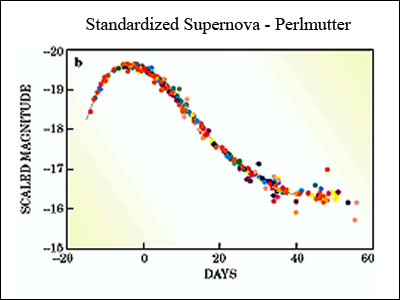 Using the Perlmutter calibration technique, if a Ia supernova has a redshift that is dimmer than expected, that supernova must be farther away than thought. Its light has taken longer to reach us, and so the universe must have taken longer to grow to its current size. Therefore, the expansion rate of the universe must have been slower in the past than expected. In fact, the distant supernovas are dim enough that the expansion of the universe must have accelerated to have caught up with its current expansion rate. When a Type II Supernova has used up all its nuclear fuel, it implodes into a small, super dense neutron star. The neutron star's gravity is so strong that its electrons have been forced into the protons in the atomic nuclei forming neutrons. A neutron star has enormous density; it is only about 12 to 18 miles in diameter yet it weighs as much as our sun. The word "pulsar" is a shortened version of "pulsating star" and was coined in 1968. A pulsar is a rapidly rotating neutron star with a strong magnetic field. See the pulsar diagram at the left. In the strong magnetic fields, electrically charged particles move along field lines. At the magnetic poles, charged particles escape in two cone shaped beams, an upper and lower beam. Radio waves are also emitted from the magnetic poles. Since the magnetic axis (red arrow) is tilted with respect to the axis of rotation (blue vertical line), the two beams of radio emission sweep across space like a lighthouse beam. The radiation can only be observed when the emission beam is pointing towards the earth. Each time one of the beams points towards the earth a radio pulse can be recorded. The observed periods of a pulsar's emission range from 1.4 milliseconds to 8.5 full seconds. There are over 2,000 known pulsars. A binary pulsar is a pulsar with a secondary companion, often a white dwarf or another neutron star. In one binary, the companion star is also a pulsar. Although the binary companion to a pulsar is usually difficult or impossible to observe, the timing of the pulses from the pulsar can be measured with extraordinary accuracy by radio telescopes. Some pulsars spin several hundred revolutions per second. The neutron star retains most of its original angular momentum and with a tiny radius, it has an extremely high rotational speed. The first binary pulsar, PSR B1913+16, was discovered in 1974 by Russell Hulse and Joseph Taylor, Jr. at the Arecibo Radio Telescope Observatory in San Juan, Puerto Rico operated by Cornell University. The Hulse Taylor binary pulsar has been observed continuously since its discovery. Einstein’s theory of General Relativity predicts that two stars moving very fast and very close together should emit large amounts of Gravitational Waves. Gravitational Waves should carry away some orbital energy and cause the two stars to draw closer together. Their orbits should shrink and their orbiting period should shorten. The Hulse Taylor pulsar orbiting period has decreased exactly as predicted by Relativity. For the pulsar binary discovery and the shortened orbiting period verification of Einstein's theory, Taylor and Hulse won the 1993 Nobel Prize in Physics. The Vela Pulsar shown at the above left is an actual gamma ray recording. The image shows pulsed gamma rays as recorded by the Fermi Gamma Ray Space Telescope. The theory behind how pulsars emit their radiation is still in its infancy even after forty years of study. Scientists do not fully understand the physics behind pulsar radiation. Recent measurements of the energies released by a pulsar are about an order of magnitude greater than models predict. The Crab Nebula (shown at the left) is the spectacular remains of a massive star that became a Type II Supernova in the year 1054. The explosion was so bright that its brilliance was recorded by the Indian, Chinese, Japanese and Arab astronomers of the day. The collapsed core of the neutron star contains a pulsar (white dot in the center) discovered in 1969. The pulsar is only 18 miles in diameter but pumps out enormous amounts of energy, making the nebula 75,000 times brighter than the sun. Images taken several years apart indicate that the Crab Nebula is currently expanding outwards about 1,000 miles per second. The combination image of the Crab Nebula at the left shows X-rays in "blue" and visible light in "red". The optical image is from the Hubble Space Telescope and the x-ray image from the Chandra X-ray Observatory. This image is one of very few that clearly shows a black hole surrounded by an accretion disk and a huge amount of gas circulating around the black hole. Gamma Rays From Crab Nebula "Off The Charts". In October of 2011, VERITAS (Very Energetic Radiation Imaging Telescope Array System) astrophysicists reported gamma rays with energies far greater than current theoretical models predict from the Crab Nebula pulsar. The pulsed gamma rays had energies between 100 and 400 billion electron volts (GeV), far higher than the 25 GeV previously detected. 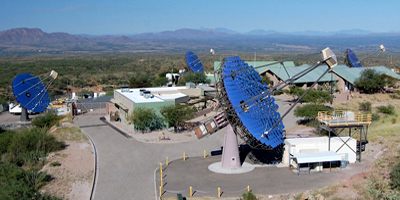 The VERITAS Project is a ground based gamma-ray observatory located at the Fred Lawrence Whipple Observatory in southern Arizona. See the picture at the left. The VERITAS four 12 meter telescope system is designed to study very high energy gamma rays, those with energies above 100 GeV. Models of pulsar emissions that explain earlier Crab Nebula observations do not explain the high VERITAS energies. Astrophysicists have a general picture of what causes pulsar emissions. 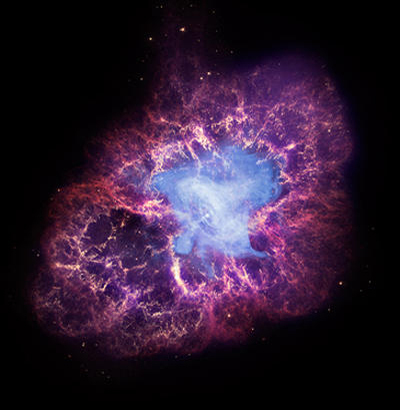 Electromagnetic forces created by a neutron star's rapidly rotating magnetic field (Crab Nebula's is 30 times a second) accelerate charged particles to near the speed of light, producing radiation over a broad spectrum. The models predicted an "exponential" decay of the emission spectrum above 10 GeV. So it came as a real surprise when pulsed gamma-ray emissions at energies above 100 GeV were found. Prior to the current Crab results, a phenomenon known as curvature radiation was the leading explanation for the Crab's gamma-ray emissions. Curvature radiation is produced when a high energy charged particle moves along a curved magnetic field. However, this mechanism cannot account for gamma rays with energies above 100 GeV. The Stanford Pulsar Study. New observations (published in January, 2017), led by Roger Romani of Stanford University, are part of a large campaign to study pulsars that emit gamma-rays. These pulsar observations show some pulsars with gamma-ray pulses and no bright radio emissions, while other pulsars produce the brightest radio pulsars known, yet do not produce any gamma rays. Some pulsars emit both gamma rays and radio emissions. 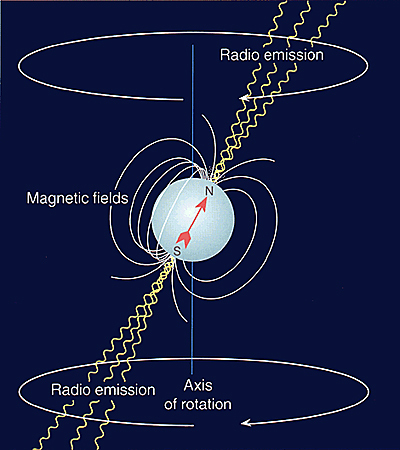 The Romani study indicates that radio pulsars produce narrow radio jets emanating from the pulsar's spin poles. While in contrast, gamma-ray emissions are produced along the pulsars' equator and align with the torus that surrounds most pulsars at their equator. See the actual Chandra photo of the pulsar Geminga to the above left. To the left below is an artist illustration clarifying the above picture. Gamma rays are coming from the torus in the middle of Geminga and the long thin radio waves are emanating from the pulsar's spin poles. All of them trail the pulsar as it is traveling very fast through space. Astronomers only see bright radio pulses when the spin orientation of the pulsar is perpendicular with the spin of the earth, while the torus and its associated gamma-ray emissions are in a direction out of our line of sight. 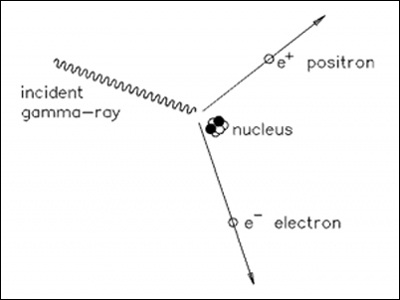 The opposite is true when gamma rays are in our line of site and the radio pulses are not. This explains why some pulsars produce only radio pulses, other pulsars produce only gamma rays, and some produce both. It all depends upon their individual spin orientations with respect to the spin of the earth. The Brightest Furthest Pulsar. 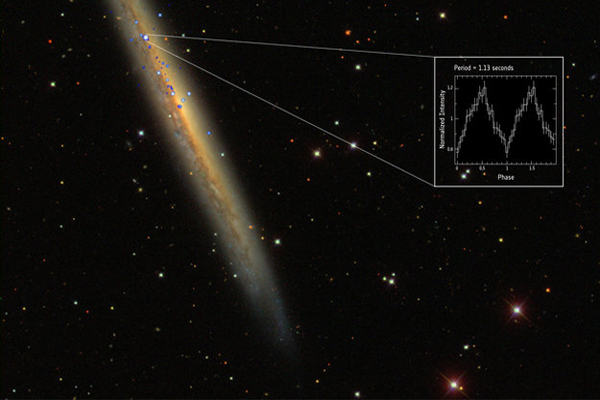 ESA’s XMM-Newton has found a record-breaking pulsar, NGC 5907 ULX-1, the spinning remains of a once massive star that is a 1,000 times brighter than previously thought possible. See the photo to the left. 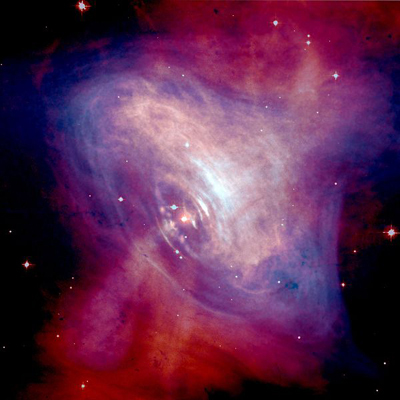 The pulsar is the most distant ever detected, with its light travelling 50 million light-years before being detected by XMM-Newton (the European Space Agency's X-ray Multi-Mirror mission). This X-ray source is the most luminous of its type ever detected. It is 10 times brighter than the previous record holder. In one second it emits the same amount of energy that is released by our Sun in 3.5 years. XMM-Newton observed the object several times in the last 13 years, the discovery a result of a systematic search for pulsars in the data archive (its 1.13 seconds of periodic pulses gave it away). The signal was also identified in NASA’s Nustar archive data, providing additional information. The archival data also revealed that the pulsar’s spin rate has changed over time, from 1.43 seconds per rotation in 2003 to 1.13 in 2014. Shri Kulkarni, Professor of Astronomy at Caltech, and his team have been hunting for super-supernovas as part of the Palomar Transient Project (PTP). They have been finding a super-supernova about every two weeks. Statistically that means that one in every 10,000 normal supernovas is a super-supernova. Super-supernovas are about "ten times brighter" than normal supernovas when they explode and much "bluer". Historically, astrophysicists believed that massive stars could not grow beyond 100 solar masses and could not explode. Theorists believed that massive stars would gradually shrink down to about 20 solar masses by expelling huge amounts of stellar wind. However, the Palomar team has found stars as big as 140 solar masses and believe there could be some as big as 200 solar masses. These super big supernovas are from the early universe and are mainly composed of hydrogen. Stars that are newer and contain heavier elements inherited from earlier supernovas ignite sooner and never get to grow into giants. Ordinary Supernovas. 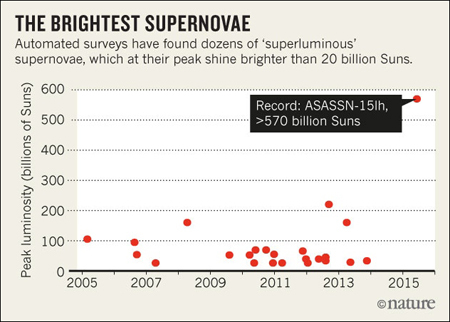 The chart above from the May, 2012 issue of Scientific American shows how an "ordinary Ia supernova" of 20 solar masses evolves. As the core ages, it condenses and a series of heavier elements are formed in an "onion-like" fashion. First, helium is formed, then carbon, neon, oxygen and so on until iron forms in the central core. This extended process may take a million or a billion years. The extreme heat and density finally triggers a runaway nuclear reaction that leads to a cataclysmic explosion. Update: Super Supernovas are now called "Super Luminous Supernovas" (SLSNs). It is believed that Super Luminous Supernovas explode by completely different mechanisms than standard supernovas. Here is a more sophisticated summary of how all supernovas are now classified. Type I Normal Supernova. For supernovas that occur in environments "with no hydrogen" the optical light we see is created by radioactivity. Most importantly, type I supernovas synthesize large amounts of nickel-56, which has a half-life of about 6 days. As the nickel decays to cobalt, it releases gamma-rays, which are trapped by the other material ejected by the supernovas. These trapped gamma-rays heat up the surrounding material until it radiates visible energy. 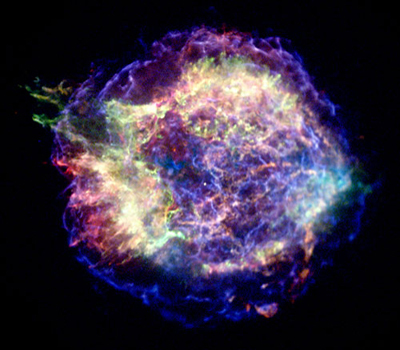 For type I supernovas the peak magnitude is proportional to the amount of nickel-56 synthesized in the explosion. Type II Normal Supernova. For supernovas that occur in environments where "hydrogen is present", the story is slightly different. Radioactivity still plays a role late in the process, but the presence of hydrogen allows for another means of converting explosion energy into radiation. When the initial explosion shock wave passes through the hydrogen envelope, it heats it up and ionizes it. The hydrogen envelope then expands and eventually cools. The peak magnitude of the type II supernova results from both the size of the hydrogen rich area and the energy within the explosion shock. Super Luminous Supernovas (SLSNs): In the figure to the left, Avishay Gal-Yam, (formerly at Caltech and currently at the Weizmann Institute of Science in Israel, an authority on super luminous supernovas) plots brightness versus time "light-curves" for three types of SLSNs. SLSNs are defined as those above the dashed black line threshold. Gal-Yam suggests there are three distinct classes of super-luminous types of events: SLSN-R, SLSN-I, and SLSN-II. SLSN-R. These are a class of SLSN that lacks hydrogen and whose light-curve decline rates are consistent with being powered by large amounts of "radioactive" nickel-56 (hence he suffice "R"). In order to reach their peak luminosities, a star would need to contribute five solar masses of nickel to be synthesized in the explosion. It would require a very large star to produce that much nickel. 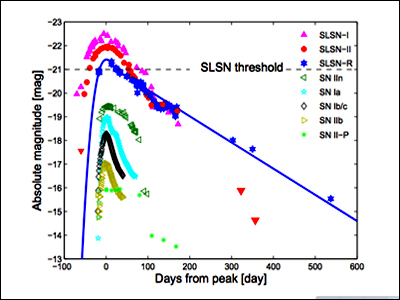 It is still debated whether or not SLSN-R events are pair instability supernovas. At this time only a handful of very distant SLSN-Rs have been identified. Detailed origin analyses have been difficult as much data is lost while searching for these unique explosions. SLSN-I. SLSN-I are another class of SLSN that lacks hydrogen, but whose light decline rates are too fast to be explained by the radioactive decay of nickel. Something else must be powering these explosions. This is still an "unsolved mystery". Several mechanisms have been proposed for SLSN-I including the shock interacting with some hydrogen poor material surrounding the star or the SLSN-I extracting the energy from a magnetized and rapidly rotating neutron star (a magnetar). The magnetar origin seems most likely. See the Magnetar section below. The bright explosion of light initially appeared in June 2015 as the faintest of dots in "automated" images taken by ASASSN (All Sky Automated Survey for Supernovas). ASASSN repeatedly observes the exact same areas of the sky to look for short very bright bursts of light. Sophisticated software spotted the sudden flux of light prompting astronomers to go fishing for follow-up observations using several other telescopes. They soon found that the light from the new source, dubbed ASASSN-15lh, had traveled for 2.8 billion years to reach earth and its luminosity outshone any previous discovered supernova. The image to the left above shows the yellow-orange host galaxy "prior" to the supernova's discovery, captured by the Dark Energy Camera of the Carnegie Institution for Science (home of the ASASSN team). The right hand image, from the Las Cumbres Observatory Global Network headquartered in Goleta, CA, shows the supernova in the same galaxy, whose bright blue light completely dominates its host. This study was published in the January, 2016 issue of Science magazine. 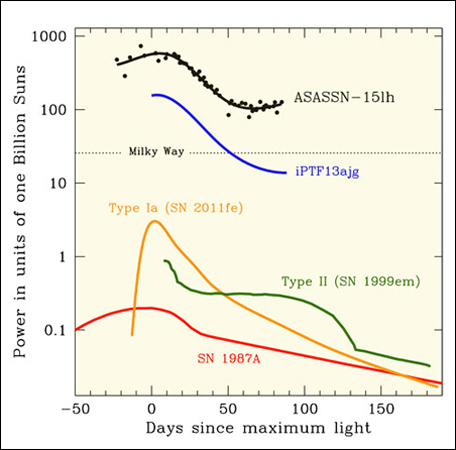 The light curve of ASASSN-15lh outshines other supernovae, even those in its "superluminous" class. At its peak, ASASSN-15lh was 200 times as bright as a typical Type Ia supernova and more than twice as bright as the previous record-holder, iPTF13ajg. See the plot of these light curves to the left. ASASSN-15lh exhibits characteristics typical of exploding stars (such as blue-colored light that brightens suddenly before fading more gradually away). It also lacks hydrogen and helium lines in its spectrum, so it seems similar to Type Ia supernovas which come from exploding white dwarfs. But, its brightness puts it at the top of the class of "superluminous supernovas". These rare diamonds shine about 10 times brighter than their more common Type Ia cousins, and ASASSN-15lh is the brightest of them all. The "most promising technical scenario" suggests a more exotic power source than your typical supernova. When a massive (but not too massive) star goes supernova, its core implodes to form a spinning neutron star. And if the circumstances are right, these crushed stellar remains carry extreme magnetic fields. These super-magnetic, rapidly spinning neutron stars, called magnetars, "might" power something as bright as ASASSN-15lh. However, ASASSN-15lh has emitted more energy than a "normal" magnetar does, i.e. more than 10^52 ergs, or 570 billion times more than the sun emits over a similar time period. See the plot of peak luminosity to the left. (Since there have been relatively few magnetars discovered, a "normal magnetar" luminosity has not yet been well established.) Therefore, there is still some mystery as to why ASASSN-15lh was so powerful and was it really a magnetar? Perhaps the Hubble Space Telescope will settle the question in late 2016 because it will allow astronomers to see the host galaxy surrounding ASASSN-15lh. If the team finds that the object lies in the very center of a large galaxy, then perhaps it is not a magnetar at all and the gas around it is not evidence of a supernova, but instead some type of non-normal activity around a supermassive black hole. What Exactly Is A Magnetar? A magnetar is an extraordinarily magnetized neutron star that spins hundreds of times per second. 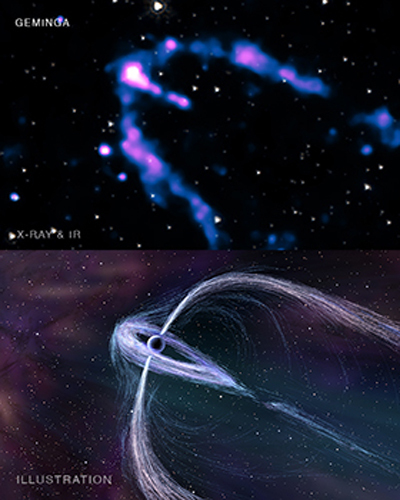 See a NASA artist's conception of a magnetar to the left. The red lines represent the extreme magnetic field which surrounds the magnetar. 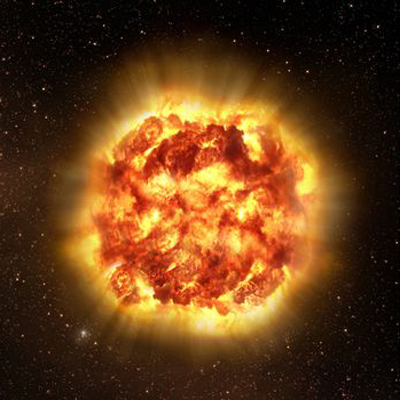 Magnetars have the mass of the sun packed into a star the size of a 12 mile (20 kilometer) diameter city. They have magnetic fields 5,000 trillion times that of the earth. The active life of a magnetar is relatively short. Their strong magnetic fields decay after about 10,000 years. The density of the interior of a magnetar is such that a thimble full of its substance would have a mass of over 100 million tons. This extraordinary mass gives a magnetar a powerful gravitational field as well. A projectile would need to fly at about half the speed of light to escape from its surface. As of December, 2013 there were 21 known magnetars in the observed universe plus 5 more candidates in line for confirmation. The magnetic field of a magnetar would be fatal to humans even at a distance of 1,000 km due to its strong magnetic field distorting the electrons of a person's atoms (making the chemistry of life impossible). A magnetar located halfway to the moon would strip the information from the magnetic stripes of all credit cards here on earth. Magnetars are the most magnetic objects in the universe. 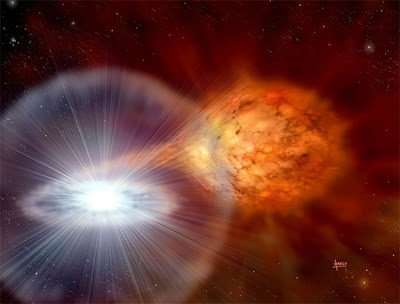 Magnetars generate powerful outflows of particles called winds. When these particles strike the surrounding gas found around them, they compress and heat the gas forming a hot dense shell that glows brightly. 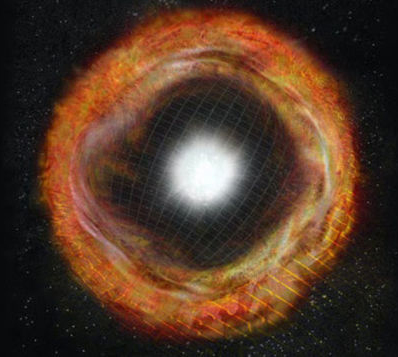 Researchers have found a strong resemblance between known stand-alone magnetars and super luminous supernovas that are believed to have been generated by a star's explosive decay into a magnetar. See the actual image to the left of magnetar 1E 2259+586 which lies about 10,000 light years away towards the constellation Cassiopeia. X-rays at low, medium and high energies are shown respectively in red, green, and blue in the image. The magnetar itself shines a brilliant blue-white, a bit to the right of center. Magnetars also have sudden huge outbreaks of energy, very similar to occasional super powerful flares from our sun. As can be seen from the illustration above, the magnetar revolves inside the complex of a super strong magnetic field. Scientists believe the magnetar has a fluid inner core surrounded by a surface crust. Researchers suspect the interior is composed of a kind of frictionless state of matter known as a "neutron superfluid". This superfluid is thought to make a magnetar's internal core spin faster than its outward crust. As the magnetar rotates through its magnetic field, the interior heats up and the superfluid boils the crust similar to huge flares on the sun's surface. It bends and stretches the crust "occasionally" making a huge break which generates a powerful "starquake". The release of the stored magnetic energy into a starquake creates a huge dense "wave" of electrons, positrons, x-rays and gamma rays that races across the universe. In 1979 a wave of x-rays and gamma rays swept over the earth, the result of a starquake many light years away, which is how the first magnetar was initially discovered. All 10 orbiting spacecraft at the time escaped permanent damage and our thick atmosphere protected us humans down here on earth. Starquakes are very rare and have only been recorded in 1979, 1998, and 2004.